Our talks about Madame Liubov Nikolaïevna Egorova have stirred up memories. Rather than attempting to put things in chronological order, I shall let emotion dictate the flow of words. I was nine years old in August 1932 when my mother died of tuberculosis. By then, we were living in France and I was a fragile tot, both physically and psychologically, having had a primary tuberculosis infection at age 5. The doctors had told my parents that it was essential to my health to have me either take exercise, or else dance lessons. And so my father asked an old brother-in-arms from his Russian regiment, Prince Nikita Troubetzkoï, whether he would intercede with his wife, Liubov Egorova, so that I might take lessons at her studio, 15 rue de la Rochefoucauld. In those days, Madame Egorova had no children’s class. She saw at once that although I knew nothing at all, there was some sort of natural ability there! She therefore packed me off to her colleague Nikolaï Kremnev. For a year, Kremnev gave me – free of charge – private lessons. When I managed to turn a pirouette he’d give me a franc, and when I turned two, he’d give me two francs to buy a lollipop. In a way, Madame Egorova was my "Mother in Dance" and in another, she stood in for my own mother, through the goodness, the tenderness and the attention she lavished upon me. Madame was a grande Dame, a great ballerina of the Maryinskii Theatre. Despite her age, one was very much aware of how the Dance inhabited her. Calm, dignified, attentive… and extremely demanding when it came to the work. As a teacher, exceptional. Above her, over the chimney piece, presided a bust of Anna Pavlova. The barre that Madame gave was rather different in its sequences from what one would see today. For example, after the ronds de jambe à terre, the grands demi-ronds de jambe jetés by "flic-flac" went from front to à la seconde and then from back to à la seconde, rather than the full rond de jambe as one does today. In the series of grands battements, we’d end with a grand battement rattrapé à la seconde before pied dans la main. I believe that some of the jump combinations, and especially the petite batterie, came from Bournonville, and from Madame’s work at the Maryinskii Theatre under Cecchetti. How distinctly I recall Madame sitting on that little bench, her eyes closed as she listened to the music, showing the steps, as though she were knitting, with her hands. Still seated, she would give the épaulements for each combination. Madame was preparing us to take to the stage as dancers. So musical, so inspired she was! When I was finally admitted to Madame’s studio, it was to the six o’clock class for children; I was soon promoted to the five o’clock class, and finally, to the eleven o’ clock class for professionals. There, almost daily, came dancers from the Opera - Solange Schwartz, Lucienne Lamballe, Lycette Darsonval and sometimes even Serge Lifar himself, who was a great friend to Madame. When the Ballets Russes de Monte Carlo were at Paris, Alexandra Danilova, her close friend Alicia Markova along with André Eglevsky, David Lichine and other soloists, would take her class. A little later, Janine Charrat and Ethéry Pagava, barely out of childhood, joined us. By the way, Ethéry Pagava played my little sister in L’Anniversaire de l’Infante with Youly Algaroff, a ballet choreographed by Madame. After the War, I would travel from Rio de Janeiro to study with Madame during my holidays. There I met Maurice Béjart, Pierre Lacotte, Ghislaine Thesmar, Raymond Franchetti, Georges Skibine and Vladimir Mechkov. Both the latter had once belonged to Les Ballets de la Jeunesse. To return to Liubov Nikolaïevna: Madame would enter the studio (we stood at our places at the barre, waiting for her). She would be wearing a navy-blue pleated skirt, a light coloured blouse and a cardigan. When it was cold, she would wear a shawl, sometimes even mittens and a scarf round her neck, in different colours – but certainly not mauve! If we children ever brought her violets, she would refuse them, save for Parma violets: in the Maryinskii Theatre, the superstition had run rife that violets were unlucky. Dancers, today, work quite differently: it’s all about technique, and especially about getting those legs up. In Madame’s day, what she taught, was dancing, although her classes were extremely difficult. The combinations forced us to dance musically, and technique was simply a means to the end. Every one of Egorova’s pupils though, ended up with excellent technique, and how they could turn! At Madame’s class, as in Preobrajenskaya’s, the pupils were expected to perform a quantity of tours en dehors and en dedans, diagonals and manèges – not to speak of fouettés. This was due to the influence of the Italian dancer Pierina Legnani, the first to dance Petipa’s The Swan Lake. Madame always remained calm; she corrected carefully, but without raising her voice. She expected strict discipline from us, and mutual respect. Above all, she insisted upon deference to the étoiles and premiers danseurs who came to class. As the guests came to the front, we would automatically move back to the second or third row. One day, a most disagreeable incident occurred: I was told off by Madame in front of the entire class, before it began. It was in 1937. As it happened, I had been asked to play in Mayerling, with Danielle Darrieux and Charles Boyer, that was being filmed in the Joinville studios. We were to dance to Tchaikovsky’s Waltz of the Flowers on Anatole Oboukhoff’s choreography. The premières danseuses were Vera Nemtchinova and Nina Kirsanova. As we were being plastered in yellow pancake makeup and black lipstick, in childish enthusiasm I used "thou" rather than "you" to Nina Kirsanova. The following day, Madame told me that I should be ashamed of the lack of respect I had shown towards my elders, and asked who I thought I was. To move on – just before turning fourteen, I auditioned for the Opéra comique and was hired as an apprentice, because neither the Opera nor the Opéra comique would take anyone under sixteen in the corps de ballet. I continued to dance meanwhile in Les Ballets de la Jeunesse, alongside Geneviève Moulin, Georges Skibine, Vladimir Mechkov, Youly Algaroff (and later Edmond Audran who replaced Skibine), Tatiana Bechenova, Nina Popova, Lillett Crenshow, Raymond Franchetti. 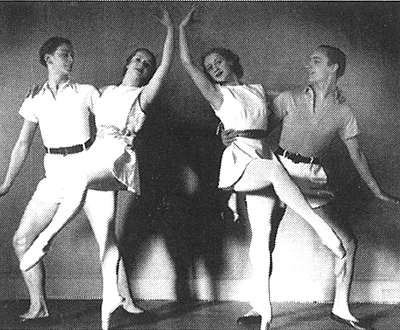 Experienced professionals like Hans Brenaa, Thomas Armour, Birger Bartholin also danced with Les Ballets de la Jeunesse. The choreographers were Madame Egorova, Birger Bartholin and Boris Romanov. Unfortunately that troupe was short-lived. One day Liubov Tchernicheva (1) and Serge Grigoriev, régisseur for the Ballets Russes de Monte Carlo, saw me in Madame’s class, and engaged me as petite soliste, with Geneviève Moulin, the Tupine brothers and Nina Popova. We were to leave for England and prepare the Convent Garden season. The year was 1939. I have a most distinct and emotional recollection of the Madame Egorova coming to bid us goodbye at the Gare du Nord as we left for London, from whence we were to embark for Australia. World War II had just broken out. It was very early morning, and icy cold, and Madame had come specially to say "God Save you" on our long voyage to distant lands. Prince Nikita Troubetzkoï, her husband, was in charge of keeping house, walking Madame’s terrier Trott and cooking lunch, generally "Kotletki" and kasha. As the lunch-hour struck, the Prince, with great dignity, would appear at the studio door, to let Madame know that class was over: so intent was she on a correction or on the fouettés that we all ran to repeat under her watchful eye, that she would often forget the time of day. I remember the many artists who passed through her studio: the Tupine brothers, who joined Les Ballets de la Jeunesse, tiny little Tatiana Rousseau, Janine Charrat, André Eglevsky, Yvette Bouland-Vinay, Vera Nemtchinova, Anna Leontieva, the daughter of Natalia Klemetskaia, who had danced for Diaghilev, Konstantin Tcherkass, who at one point, directed the Ballet of the Opéra comique, Mia Slavenska, Hélène Kirsova and the Czech Edouard Borovansky (2), who became pioneers of classical dancing in Australia, the American sisters Catherine (3) and Dorothy Littlefield who founded the Philadelphia Ballet (4). And the many Danes! Most of "her" dancers went on to a brilliant career. The last time I set eyes on Madame Egorova, she was very elderly indeed. It was in the infirmary of the Maison Russe at Sainte-Geneviève-des-Bois. Later, she was to be buried in the Russian Cemetery there. To Madame Egorova, I owe all that I am, and all that I have been. I owe her my life, because she gave me a trade. And I lived from that trade as a dancer, maître de ballet, choreographer and teacher, whether at London, Australia, in the USA, Canada, Mexico, Cuba, or Central and South America. Finally I reached Brazil with Les Ballets Russes du Colonel de Basil, and there I stayed. Thanks to the fact that Madame had prepared me so well for the stage, I was enabled to join Les Ballets Russes du Colonel de Basil. Thanks to that, I had the great good luck to work directly under Mikhaïl Fokine, Bronislava Nijinska, Leonid Massine, Georges Balanchine, David Lichine, and to learn the repertory from them as well. 4. It was in 1936. In 1937 the Philadelphia Ballet presented the first full-length "Beauty" in the USA. Tatiana Leskova was born in Paris in 1922 to parents who had fled the Russian Revolution. Her name today is synonymous with classical dance in Brazil, where she settled in 1945. In 1950, she began to work at the Rio de Janeiro Teatro Municipal in various artistic capacities and raised the ballet to international standards – meanwhile founding her own school - before being appointed Artistic Director at the Theatre in the 1970s. She has worked around the world as a stager notably for Massine’s Les Présages and Choreartium.